Facebook introduced a new feature to create a list on Facebook different from Facebook default list to choose from and describe your current state. The new list option allows users to create their own title different from Facebook list title and different from other users title. Facebook has unleashed a lot of features in the past to make the platform user-friendly based on users surveys. 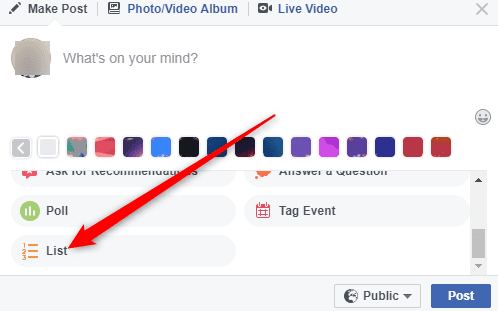 However, if you are few of those that would love to create a list on Facebook different from the Facebook list here is how to create one. Meanwhile, some Facebook accounts are yet to receive this update. Just like my primary Facebook account using FB app for Android, the new feature to create Facebook list has is yet to reflect while the feature is available on the account I will use for this guideline. The guideline to create a Facebook list on a desktop is the same guideline to create a list on your Facebook account on mobile. Meanwhile, before you proceed you can check how to view Facebook desktop on mobile reading this article. 4. Enter your Facebook list title, enter list by clicking on”Add items” and click post to publish it. Below is the result of the list I created on Facebook using this tutorial. With the new Facebook feature to create a list of a table using list numbering and bullet list will help users to create a table of comparison on Facebook without using any other tools.